Alfred Sant addressing the conference. Alfred Sant said he will announce his decision whether to run again for the post of MEP later this month. 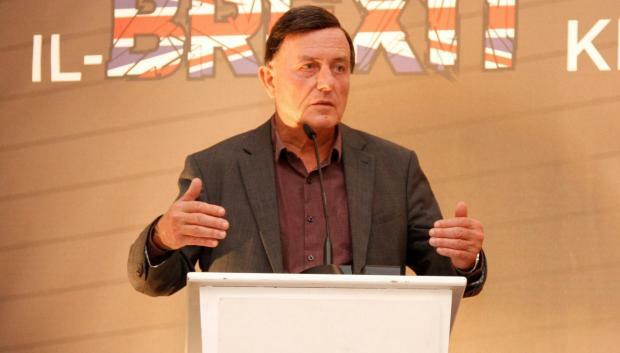 Speaking during a debate on Friday night, the former prime minister said he would be taking the interests of Malta and the Labour Party when he makes his decision whether to contest May's election to retain his seat. Dr Sant, Labour leader between 1992 and 2008, was elected outright when he contested the MEP elections in 2014. He was being interviewed during a conference which discussed Brexit. He said a government spokesman informed him that the UK government is focused to close the negotiations by the end of November. Dr Sant said the UK's departure from the EU will not affect bilateral agreements between Malta and the UK in the medical field, treatment of sick persons in UK hospitals and in education. However, EU scholarships to students wishing to further their studies in UK universities will cease with Brexit though those Maltese already working in the UK will not be impacted. Dr Sant said Brexit will negatively affect the European Budget (2020-2027) because the UK is the second largest contributor to the EU after Germany.